I had always wanted to try Mamak in the city however never made it there and didn’t really fancy having to queue for hours outside. If you haven’t heard of Mamak it is a Malaysian restaurant which is renowned for having amazing food, hence the constant queue to get a seat! I was therefore very excited to hear that Mamak was to be opening in Chatswood in Eat Street. In their own words, Eat Street is a new addition to the Chatswood eating scene, and is located at 1-5 Railway Street. To date the restaurants that have opened on ‘Eat Street’ are Mamak, Crazy Wings, Bavarian Bier Cafe, Rocket Restaurant, Three Beans Cafe and Izakaya Arigato with The Bells Thai Restaurant and Chicken 18 Plus coming soon. As always I did a bit of research on Mamak before going to eat there as I never want to find myself in a situation at a restaurant where I cannot eat anything or the restaurant doesn’t understand my allergies and I therefore cannot be guaranteed a safe meal! Being active on Twitter I decided to tweet EatStreetSYD to find out if they could help me out. Jess Brown the face behind the EatStreetSYD Twitter account was extremely helpful and found out that I could have the Nasi lemak (fragrant coconut rice accompanied by an ensemble of sambal, peanuts, crispy anchovies, cucumber and hard-boiled egg, arguably Malaysia’s national dish) with fish curry, the chicken/beef satay sticks, Sambal udang (stir-fried tiger prawns with fiery sambal sauce and possibly the curry’s (however she said I would have to check about these dishes when I got there). 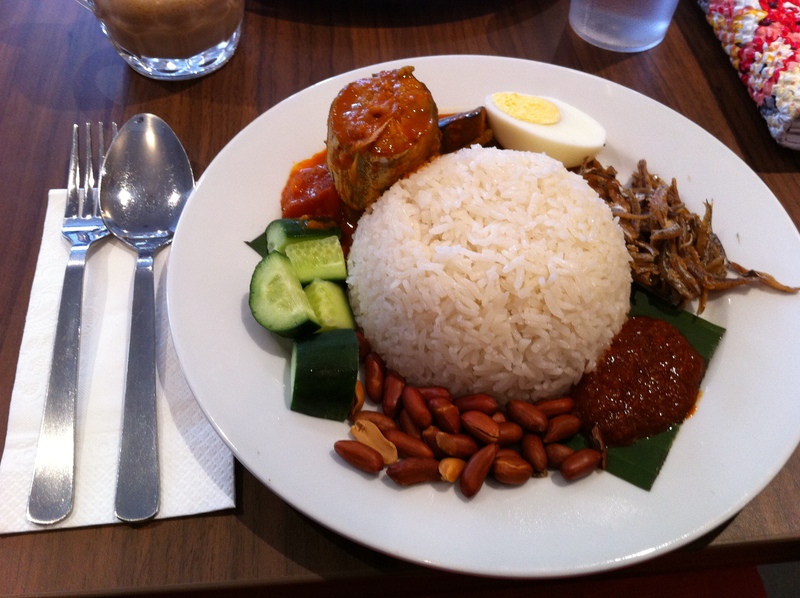 On my lunchtime visit to Mamak I was pleased to find that I did not have to wait and was seated immediately, however it did take awhile to attract someones attention to take my order once I had decided what to eat. 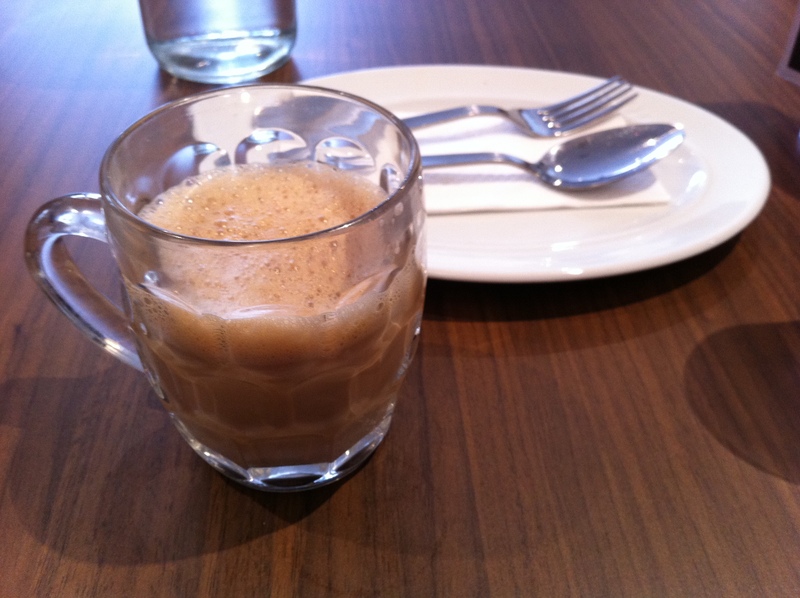 I started with a Teh tarik, a classic Malaysian sweetened tea, ‘stretched’ for a frothy topping for $3.50. Basically this means that a mixture of black tea and condensed milk is poured back and forth repeatedly between two vessels from a height, giving it a thick frothy top. This drink wasn’t too sweet, but sweet enough to be very different to a plain black tea. However I would recommend drinking it before or after your meal as it doesn’t mix too well with the spiciness of the meals. For my meal, having seen a write up on the Nasi lemak here I decided to try it as it seemed like something a bit different. I would have liked to try a couple of other dishes but since I was on my own I would not have been able to stomach it! The rice wasn’t as fragrant as I expected, although I didn’t really know what to expect with coconut rice. The fish curry had a great flavour to it and I was a big fan of the roasted peanuts. The sambal sauce wasn’t as hot as I would have expected but gave it a nice kick, contrasted by the refreshing taste of the cucumber. Finally the anchovies only had a slight fishy taste (which is good considering I cannot stand anchovies on caesar salad) and took me back to my travels around Asia where these are a common addition to a number of dishes. The best part about it was that the Nasi Lemak was only $7.50, and although you have to add $3 for the fish curry (you can also choose from chicken, lamb and vegetarian curry) it still works out to be a pretty cheap lunch these days. Next time I visit Mamak, as there will definitely be a next time, I plan to try the Sambal udang so stay tuned. Have you eaten at Mamak? What did you try? 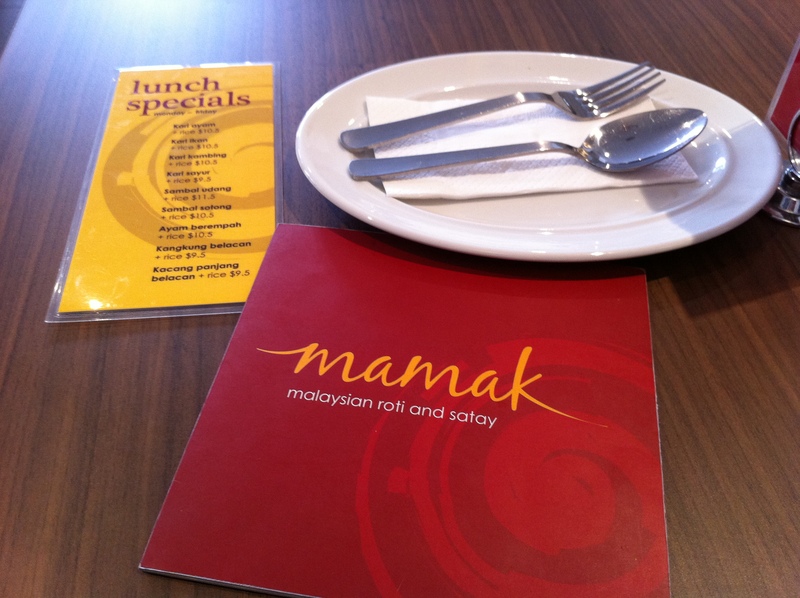 I work in chatswood so we hit up Mamak last week at lunch time. We arrived at about 1pm – 1.30pm so we didnt have any problems getting a seat either. I had the Roti Kaya – a roti filled with a sweet coconut & caramel filling. I love roti kaya so it was definately a winner! My friends got a curry of some variety, a fried chicken dish of some variety and some roti canai to try which they said they were very happy with. Its pretty cheap & essentially fast food. I’ll defs go back though! Sunny – I have heard the Roti is amazing, it’s a shame I cannot eat it! Thanks for the comment. Hi! What a fantastic blog! Well done and I’m so glad you liked Mamak Chatswood. Thanks for your mention of Eat Street! Thanks Jess 🙂 No problems – I want to try everything at Eat Street so stay tuned for more posts!